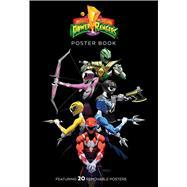 Features 21 removeable posters taken straight from the covers of the hit comic book series Mighty Morphin Power Rangers. The Mighty Morphin Power Rangers Poster Book brings you the cover artwork from the hit comic book series in a stunning format. Featuring artwork from some of comics top talents including: Babs Tarr?, Dustin Nguyen? ?, Felipe Massafera?, George Caltsoudas, Goni Montes, Helen Chen, Jamal Campbell, Joe Quinones, Kelsey Beckett, Kevin Wada, Nick Robles, Riley Rossmo?, ?Tula Lotay and more! This explosive collection of covers is sure to please fans of both the comic and and the original series!